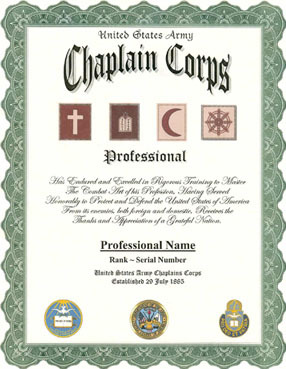 An unaltered photocopy of your Report of Separation listing your Chaplain occupation specialty. The heritage of Military Chaplaincy reaches far back into the dim recesses of history. In times of turmoil, trouble, and terror mankind always looks to religion and religious figures for comfort. War is no exception. Both ancient and modern societies have turned to religion in periods of conflict. Communities always have extended the comfort of religion to those serving in the heart of battle. 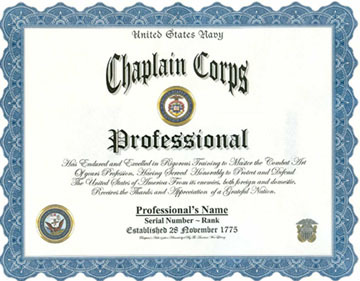 United States Military Chaplains are appointed upon completion of training and/or fulfillment of required criteria.